The Middle Kingdom (c. 2000-1650 BCE) was marked by the reunification of Egypt following a period of weak pharaonic power and civil war called the First Intermediate. Innovations during the Middle Kingdom included the solemnity evident in portraits of Senusret III and block statues. Mentuhotep II receiving offerings: Mentuhotep II, seated, holds the crook as a symbol of power. The Middle Kingdom (c. 2000-1650 BCE) was marked by the reunification of Egypt following a period of weak pharaonic power and civil war called the First Intermediate. Mentuhotep II restored stability in 2041 BCE after launching an attack that met with little resistance. After toppling the last rulers of the Tenth Dynasty, Mentuhotep II began consolidating his power over all Egypt, completing the process circa 2000 BCE. His subjects considered him to be divine or semi-divine, as suggested in a relief depicting the pharaoh receiving offerings. During the Middle Kingdom, relief and portrait sculpture captured subtle, individual details that reached new heights of technical perfection. 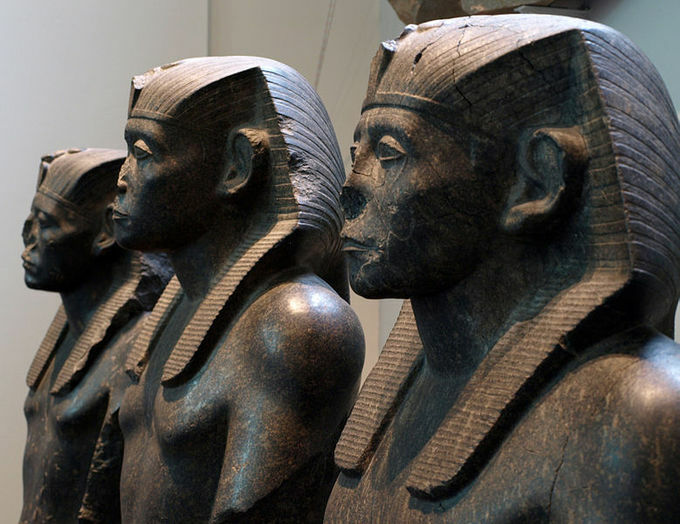 Some of the finest examples of sculpture during this time was at the height of the empire under Pharaoh Senusret III. Senusret III (also written as Senwosret III or Sesostris III) ruled from 1878–1839 BCE and was the fifth monarch of the Twelfth Dynasty of the Middle Kingdom. His military campaigns gave rise to an era of peace and economic prosperity that not only reduced the power of regional rulers, but also led to a revival in craftwork, trade, and urban development in the Egyptian kingdom. One of the few kings who were deified and honored with a cult during their own lifetime, he is considered to be perhaps the most powerful Egyptian ruler of the dynasty. Head of pharaoh Sesostris III, made of red granite, circa 1850 BCE: Some of the sculptures of Senusret III, like this one, portray him as an aging man—a style that deviated from the standard representation of kings. 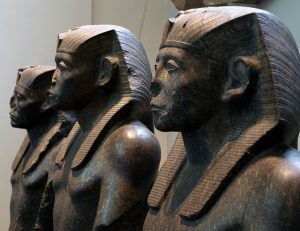 Aside from his accomplishments in architecture and war, Senusret III is known for his strikingly somber sculptures in which he appears careworn and grave. Deviating from the standard way of representing kings, Senusret III and his successor Amenemhat III had themselves portrayed as mature, aging men. This is often interpreted as a portrayal of the burden of power and kingship. The change in representation as ideological, and not something to be interpreted as the portrayal of an aging king, is shown by the fact that in one single relief, Senusret III was represented as a vigorous young man, following the centuries old tradition, and as a mature aging king. Example of a block statue: Block statues of the Middle Kingdom consisted of a man squatting with his knees drawn up to his chest. Another important innovation in sculpture that occurred during the Middle Kingdom was the block statue, which would continue to be popular through to the Ptolemaic age almost 2,000 years later. Block statues consist of a man squatting with his knees drawn up to his chest and his arms folded on top of his knees. Often, these men are wearing a wide cloak that reduces the body of the figure to a simple block-like shape. In some cases the cloak covers the feet completely, and in others the feet are left uncovered. The head of the sculpture contains the most detail. Head and torso of a noblewoman (Twelfth Dynasty): This sculpture, commissioned by a noblewoman, provides evidence of gender equality among the elite during the Middle Kingdom. The sculpture pictured below—the fact that a private woman could have a sculpture made for herself—speaks volumes for the equality of gender in ancient Egypt. The heavy tripartite wig frames the broad face and passes behind the ears, thus giving the impression of forcing them forward. They are large in keeping with the ancient Egyptian ideal of beauty; the same ideal required small breasts, and in this respect, the sculpture is no exception. Whereas the natural curve of the eyebrows dips towards the root of the nose, the artificial eyebrows in low relief are absolutely straight above the inner corners of the eyes, a feature which places the bust early in the early Twelfth Dynasty. Around 1900 BCE, these artificial eyebrows, too, began to follow the natural curve and dipped toward the nose. Grand and royal tombs continued to be built for the deceased during the prosperous Middle Kingdom. Royal funerary practices in the Middle Kingdom remained much the same as in the Old Kingdom, with kings continuing to build pyramids for their burials. Unlike the Old Kingdom, however, Middle Kingdom royal pyramids were not quite as well constructed, and so few of them remain as pyramid structures today. Among the tombs built during this time are Amenemhat I’s funerary monument at El-Lisht; Sesostris I’s funerary monument; Amenemhat III’s pyramid at Hawara, which includes an elaborate labyrinth complex; and Sesostris II’s pyramid at Illahun. The construction of pyramids declined toward the end of the Twelfth Dynasty , as instability led to the decline of the Middle Kingdom. Burial goods continued to be commonplace in tombs. Starting in the First Intermediate period, wooden models became very popular, often depicting everyday activities that the deceased expected to continue doing in the afterlife. The standard coffin was rectangular and brightly painted, often including an offering formula. Unlike the Old Kingdom, objects of daily use were not often included in the tombs; however, they reappeared toward the end of the Middle Kingdom. Other new objects were introduced toward the end of the Middle Kingdom as well, including the first shabtis (also known as ushabtis) and the first scarabs. 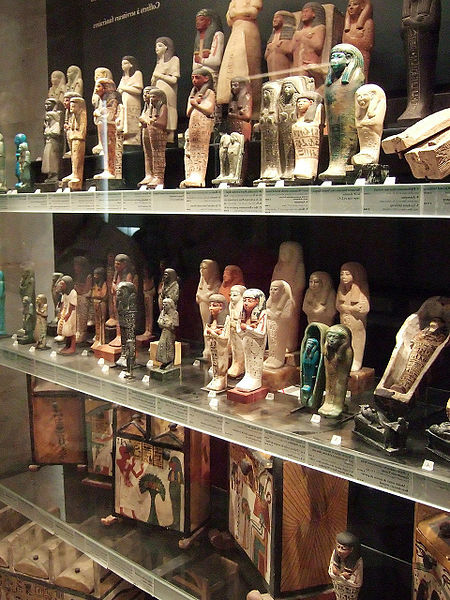 Shabtis were funerary figurines placed in tombs of the deceased to help them in the afterlife. 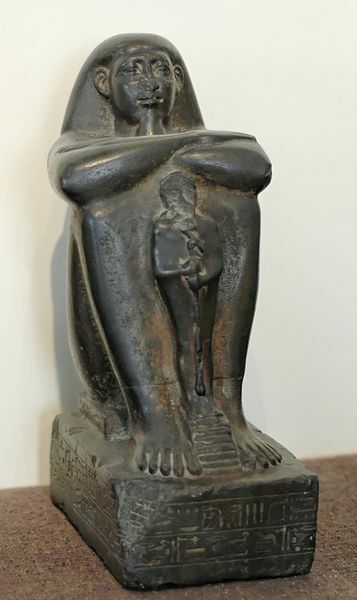 Used from the Middle Kingdom until the end of the Ptolemaic Period nearly 2000 years later, most shabtis were of a small size, often covering the floor around a sarcophagus . Exceptional shabtis were of larger size, or produced as a one-of-a-kind master work. They were generally distinguished from other statuettes by being inscribed with the name of the deceased, his titles, and often with spells from the Coffin Texts. Shabtis were created to act as the deceased’s servants, performing the manual labor necessary for the plentiful existence of the afterlife. Shabti figures: Shabti were funerary figurines that were placed in tombs along with the deceased to assist them in the afterlife. Scarabs were popular amulets believed to be protectors of written products. 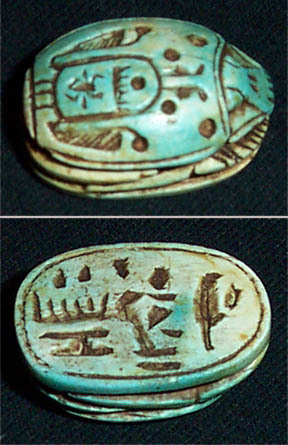 The scarab was also used as a holder or medium for personal name seals. 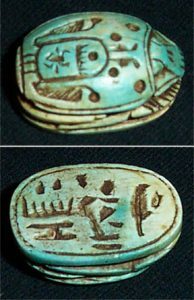 A figurine of a scarab would be carved out of stone, and then on the smooth stomach of the scarab, the engraving of a seal was made. A modern imitation of an ancient Egyptian scarab amulet: Scarabs were often included in tombs along with other burial goods as protectors of written products. Another change in funerary practice during this time had to do with non-royal Egyptians. In contrast to elitist Old Kingdom attitudes towards the gods, the Middle Kingdom experienced an increase in expressions of personal piety and what could be called a democratization of the afterlife. In this worldview , all people possessed a soul and could be welcomed into the company of the gods after death. In the Old Kingdom, the Pyramid Texts, which contained spells to help the dead reach the afterlife successfully, were only accessible to the elite. During the Middle Kingdom, Egyptians outside of the elite levels of society gained access to this funerary literature and began incorporating it into their own burials. 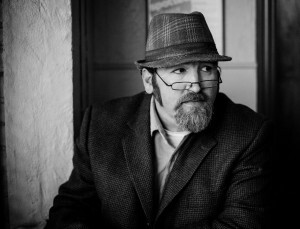 Coffin Texts, as they are called by the scholars, expanded upon the Pyramid Texts, introducing new spells and incorporating slight changes to make them more relatable to the nobility. As seen in the image below, Coffin Texts could appear as paintings or inscriptions on the inside of the coffin. Due to the limited writing surfaces of some of these objects, the spells were often abbreviated, giving rise to long and short versions. 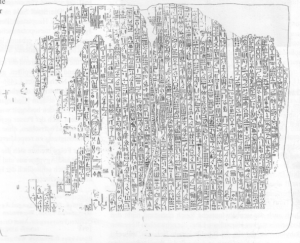 Map of the netherworld from the coffin of Gua, from Deir el-Bersha, Egypt (Twelfth Dynasty, 1985-1795 BCE): The map inscribed in this coffin comprises part of the Coffin Texts intended to help the deceased navigate through the Duat. In contrast to the Pyramid Texts, which focus on the celestial realm, the Coffin Texts emphasize the subterranean elements of the afterlife ruled by Osiris in a place called the Duat. People of all classes had access to this afterlife, in which they would be judged by Osiris and his council according to their deeds in life. This realm is described as containing threatening beings, traps, and snares for which the deceased must be prepared. Spells in the Coffin Texts were intended to help the deceased contend with these impediments. The stelae of Ancient Egypt served many purposes, from funerary, to marking territory, to publishing decrees. Egyptians were well known for their stelae, the earliest of which date back to the mid- to late third millennium BCE. Stelae are stone slabs that served many purposes, from funerary, to marking territory, to publishing decrees. Images and text were intimately interwoven and inscribed, carved in relief , or painted on the stelae. While most stelae were taller than they were wide, the slab stelae took a horizontal dimension and was used by a small list of ancient Egyptian dignitaries or their wives. The huge number of stelae surviving from ancient Egypt constitute one of the largest and most significant sources of information on those civilizations . 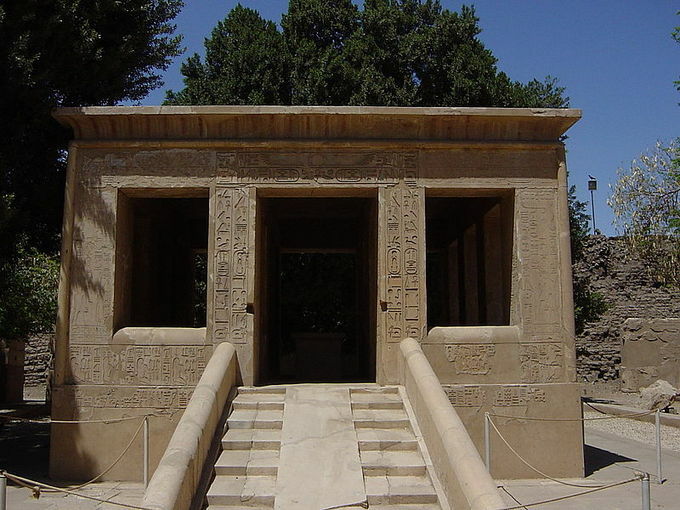 Funerary stelae were generally built in honor of the deceased and decorated with their names and titles. While some funerary stelae were in the form of slab stelae, this funerary stelae of a bowman named Semin (c. 2120-2051 BCE) appears to have been a traditional vertical stelae. Funerary stelae of the bowman Semin: Funerary stelae were usually inscribed with the name and title of the deceased, along with images or hieroglyphs. Slab stelae, when used for funerary purposes, were commonly commissioned by dignitaries and their wives. They also served as doorway lintels as early as the third millennium BCE, most famously decorating the home of Old Kingdom architect Hemon. 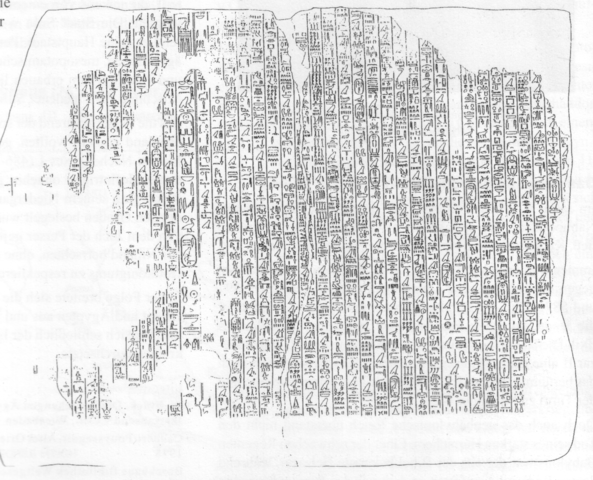 Annals of Amenemhat II: This drawing represents one of the larger fragments of this stelae. Stelae also were used to publish laws and decrees, to record a ruler’s exploits and honors, mark sacred territories or mortgaged properties, or to commemorate military victories. Much of what we know of the kingdoms and administrations of Egyptian kings are from the public and private stelae that recorded bureaucratic titles and other administrative information. One example of such stelae is the Annals of Amenemhat II, an important historical document for the reign of Amenemhat II (r. 1929–1895 BCE) and also for the history of Ancient Egypt and understanding kingship in general. Obelisk of Senusret I: This obelisk is one half of a pair that originally marked the entrance to the temple of the sun god Ra. Many stelae were used as territorial markers to delineate land ownership. The most famous of these would be used at Amarna during the New Kingdom under Akhenaten. For much of Egyptian history, including the Middle Kingdom , obelisks erected in pairs were used to mark the entrances of temples. The earliest temple obelisk still in its original position is the red granite Obelisk of Senusret I (Twelfth Dynasty) at Al-Matariyyah in modern Heliopolis. The obelisk was the symbol and perceived place of existence of the sun god Ra. When Egypt had military and political security and vast agricultural and mineral wealth, its architecture flourished. As the pharaohs of the Middle Kingdom restored the country’s prosperity and stability, there was a resurgence of building projects. When Egypt had secured military and political security and vast agricultural and mineral wealth, its architecture flourished. Grand tombs in the form of pyramids continued to be built throughout the Middle Kingdom, along with villages, cities, and forts. 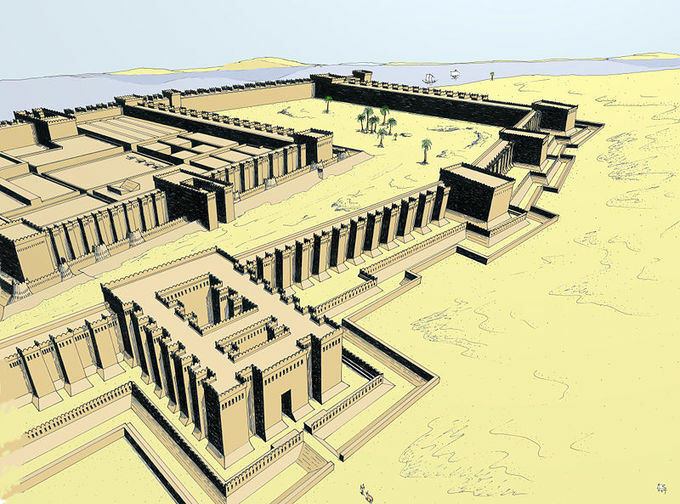 The reign of Amenemhat III is especially known for its exploitation of resources, in which mining camps—previously only used by intermittent expeditions—were operated on a semi-permanent basis. A vast labor force of Canaanite settlers from the Near East aided in mining and building campaigns. Ancient Egyptian architects used sun-dried bricks, fine sandstone, limestone, and granite for their building purposes. As in the Old Kingdom, stone was most often reserved for tombs and temples, while bricks were used for palaces, fortresses, everyday houses, and town walls. Mud was collected from the nearby Nile River, placed in molds, and left to dry and harden in the hot sun until they formed bricks for construction. Architects carefully planned all their work, fitting their stones and bricks precisely together. Hieroglyphic and pictorial carvings in brilliant colors were abundantly used to decorate Egyptian structures, and motifs such as the scarab, sacred beetle, solar disk, and vulture were common. Black Pyramid of Amenemhat III: Middle Kingdom pyramids consist of mud brick and clay encased in limestone. The Black Pyramid, the first to house both the pharaoh and his queens, was built for Amenemhat III (r. 1860–1814 BCE). It is one of the five remaining pyramids of the original eleven pyramids at Dahshur in Egypt. Originally named Amenemhet is Mighty, the pyramid earned the name “Black Pyramid” for its dark, decaying appearance as a rubble mound. Typical for Middle Kingdom pyramids, the Black Pyramid, although encased in limestone, is made of mud brick and clay instead of stone. The ground-level structures consist of the entrance opening into the courtyard and mortuary temple, surrounded by walls. There are two sets of walls; between them, there are ten shaft tombs, which are a type of burial structure formed from graves built into natural rock. The capstone of the pyramid was covered with inscriptions and religious symbols. A view of Buhen from the north: Buhen was an ancient fort built by Senusret III during his multiple campaigns. Its moat, drawbridges, and bastions would have provided good defense against enemy attacks. Workers’ villages were often built nearby to pyramid construction sites. Kahun (also known as El-Lahun), for example, is a village that was associated with the pyramid of Senusret II. The town was laid out in a regular plan, with mud-brick town walls on three sides. No evidence was found of a fourth wall, which may have collapsed and been washed away during the annual inundation. The town was rectangular in shape and was divided internally by a mud brick wall as large and strong as the exterior walls. This wall divided about one third of the area of the town, and in this smaller area the houses consisted of rows of back-to-back, side-by-side single room houses. The larger area, which was higher up the slope and thus benefited from whatever breeze was blowing, contained a much smaller number of large, multi-room villas, indicating perhaps a class separation between workers and overseers. A major feature of the town was the so-called “acropolis” building; its column bases suggest its importance. Senusret III was a warrior-king who helped the Middle Kingdom reach its height of prosperity. In his sixth year, he re-dredged an Old Kingdom canal around the first cataract to facilitate travel to upper Nubia, using this to launch a series of brutal campaigns. After his victories, Senusret III built a series of massive forts throughout the country to establish the formal boundary between Egyptian conquests and unconquered Nubia. Buhen was the northernmost of a line of forts within signaling distance of one another. 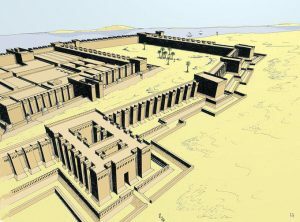 The fortress itself extended more than 150 meters along the west bank of the Nile, covering 13,000 square meters, and had within its wall a small town laid out in a grid system. At its peak, it probably had a population of around 3500 people. The fortress also included the administration for the whole fortified region. Its fortifications included a moat three meters deep, drawbridges, bastions, buttresses , ramparts, battlements, loopholes, and a catapult. The walls of the fort were about five meters thick and ten meters high. The White Chapel: The White Chapel of Senusret I at Karnak is a good example of the fine quality of art and architecture produced during the Twelfth Dynasty. Its columns hold reliefs of a very high quality, which are hardly seen elsewhere at Karnak. 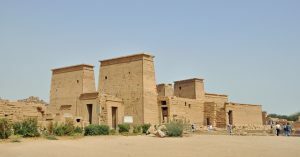 The Karnak Temple Complex is an example of fine architecture that was begun during the Middle Kingdom and continued through the Ptolemaic period. Built by Senusret I, it was comprised of a vast mix of temples, chapels, pylons , and other buildings. The White Chapel, also referred to as the Jubilee Chapel, is one of the finest examples of architecture during this time. Its columns were intricately decorated with reliefs of a very high quality. Later in the New Kingdom, the Chapel was demolished; however, the dismantled pieces were discovered in the 1920s and carefully assembled into the building that is seen today.